What is a REAL Opportunity? The competencies are incorporated into the Engaged Learning Tools to promote student success and development at UC San Diego. 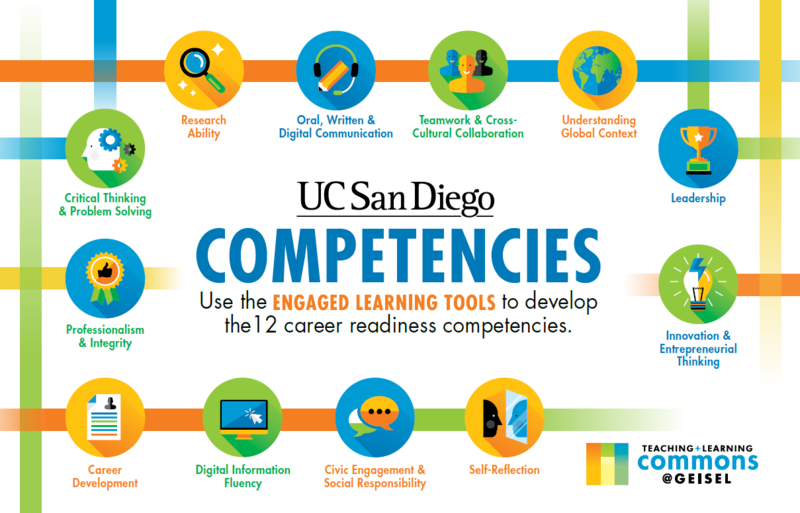 The competencies are reviewed on a four-year cycle by the UCSD Education Initiative Workgroup. Critical thinking & problem solving: Identifies important problems and questions and gathers, analyzes, evaluates information from a variety of sources before forming a strategy, decision, or opinion. Research ability: Accesses and evaluates multiple sources of information, including text and images, and synthesizes information to solve problems and create new insights. Oral, written, & digital communication: Conveys meaning and responds to needs of diverse audiences through writing and speaking coherently and effectively, and develops the expression of ideas throughwritten, oral and digital mediums. Teamwork & cross-cultural collaboration: Works withand seeks involvement from people and entities with diverse experiences towards a common goal, demonstrating strong interpersonal skills, respect, and dignity for others. Understanding global context: Demonstrates an understanding of complex global issues and systems, and how issues and actions have local and global implications for the future. Leadership: Takes initiative, demonstrates effective decision making and informed risk taking, and motivates and encourages participation from others to work towards a shared purpose and vision. Professionalism & integrity: Demonstrates integrity, honesty, dependability and ethical responsibility, and accepts direction and personal accountability. Self-reflection: Assesses, articulates, and acknowledges personal skills and abilities, and learns from past experiences and feedback to gain new insights and understandings. Career development: Accesses information and opportunities for career exploration, and understands and articulates the importance of transferable skills in the job search process. Digital information fluency: Demonstrates technological literacy and skills, and ethically and effectively uses technology to communicate, problem-solve, and complete tasks. Civic engagement & social responsibility: Participates in service/ volunteer activities characterized by reciprocity, engages in critical reflection, and appropriately challenges unfair and unjust behavior to make a positive difference in the community. Innovation & entrepreneurial thinking: Synthesizes existing ideas and concepts in innovative and creative ways to develop new ways of thinking or working, and engages in divergent thinking and risk taking. Copyright ©2018 Regents of the University of California. All rights reserved.